Jumpstart your child’s musical journey with violin lessons! 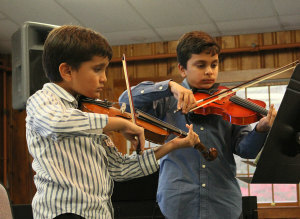 We offer violin lessons for all ages and levels. Meet with our expert teachers for one-on-one private violin lessons. Students and teachers will work out of popular method books like the Suzuki method and the Mark O’Connor method. As students progress in their violin lessons they will have the option of choosing to explore music of different cultures/genres like classical, Celtic, bluegrass, rock/pop and jazz. Violin lessons will begin as early as 5 years old. Start learning how to play the violin today! Don’t have a violin to play yet? We offer a rental program to beginner violinists as well as comprehensive repair service to keep the student’s instrument in top playing condition. For information about our repairs click here: Violin Rental.